SBCC on the Development-Entertainment spectrum. Social and behavior change communication (SBCC), often also only "BCC" or "Communication for Development (C4D)" is an interactive process of any intervention with individuals, communities and/or societies (as integrated with an overall program) to develop communication strategies to promote positive behaviors which are appropriate to their settings and there by solve world's most pressing health problems. This in turn provides a supportive environment which will enable people to initiate, sustain and maintain positive and desirable behavior outcomes. SBCC is the strategic use of communication to promote positive health outcomes, based on proven theories and models of behavior change. SBCC employs a systematic process beginning with formative research and behavior analysis, followed by communication planning, implementation, and monitoring and evaluation. Audiences are carefully segmented, messages and materials are pre-tested, and mass media (which include radio, television, billboards, print material, internet), interpersonal channels (such as client-provider interaction, group presentations) and community mobilisation are used to achieve defined behavioral objectives. BCC should not be confused with behavior modification, a term with specific meaning in a clinical psychiatry setting. Providing people with information and teaching them how they should behave does not lead to desirable change in their response/behavior. However, when there is a supportive environment with information and communication (teaching) then there is a desirable change in the behavior of the target group. Thus, SBCC is proved to be an instructional intervention which has a close interface with education and communication. It is a strategic and group oriented form of communication to perceive a desired change in behavior of target group. However, it is not as easy as it sounds, as there is no one-size-fits all strategy for any intervention. Interventions are context specific. Therefore, there is a need for proper information management and sharing. It is advised to document and report the interventions that worked somewhere, for example, the kind of messages, the medium and the audience. SBCC has several levels at which it can be implemented. Each level includes several theories. Each level (and each theory) employs specific communication channels. 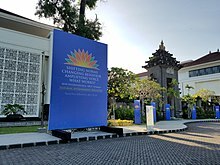 The SBCC Summit 2018 in Bali, Indonesia, focusing on social and behavior change communication and featuring Entertainment-Education. Over 1,200 attendees came to the 2018 SBCC Summit, where Entertainment-Education was a main topic among Social and Behavior Chance Communications professionals. SBCC is different from the ordinary instructional method of communication and is target specific. A society consists of many sub-groups. The strategy for SBCC will vary from group to group. The following points are important while considering the SBCC strategy. There can be several more points in this list. A successful SBCC requires lots of research and meticulous planning about the knowledge content of the subject and behavior/attitude pattern of the target group. Social marketing has been described as a tool for sustainable behaviour change. SBCC has proven effective in several health areas, such as increasing the use of family planning methods,reducing the spread of malaria and other infectious diseases, and improving newborn and maternal health. SBCC is an effective tool for dealing with many community and group related problems. BCC has been adapted as an effective strategy for community mobilization, health and environment education and various public outreach programs. Enhanced knowledge about the behavior change process has facilitated the design of communications programs to reduce the risk of HIV transmission and AIDS. A wide variety of health promotion strategies use communication as either an educational or norm-forming strategy. In addition, specific strategies must be designed for high-risk groups such as women, young people, injecting drug abusers, homosexuals and HIV positive groups. ^ a b "COMMUNICATION/BEHAVIOR CHANGE TOOLS" (PDF). Entertainment-Education. United Nations Population Funds. 1: 1–6. January 2002. ^ "Behavior Change Communication — MEASURE Evaluation". www.measureevaluation.org. Retrieved 2017-03-23. ^ "A Tool Box for Building Health Communication Capacity". Archived from the original on 4 February 2010. Retrieved 29 April 2010. ^ Davidson; et al. (2003). "Evidence-based behaviour change medicine: what is it and how do we achieve it?". Annals of Behavioral Medicine. 26: 161–171. ^ a b c "Behavior Change Communication (BCC) for HIV/AIDS: a strategic framework" (PDF). Family Health International (FHI). September 2002. ^ Osbaldiston, R; Sheldon, K (2002). Schmuck, A; Schultz, W (eds.). "Social dilemmas and sustainable development: Promoting the motivation to cooperate with the future". Psychology of Sustainability. Boston: Kluwer: 37–57. ^ a b c Aggleton, P. (April 1997). "Behavior change communication strategies". AIDS Educ Prev. 9 (2): 111–23. PMID 9167797. ^ Merritt, Rowena; Truss, Aiden; Hopwood, Toby (17 March 2011). "Social marketing can help achieve sustainable behaviour change". The Guardian. Retrieved 11 June 2017. ^ Woods N., Lisa (2006). BEHAVIOUR CHANGE COMMUNICATION IN EMERGENCIES: A TOOLKIT (PDF). Nepal: United Nations Children’s Fund. p. 246. ISBN 99946-896-1-4. This page was last edited on 28 October 2018, at 06:47 (UTC).